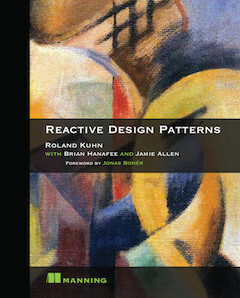 This website accompanies the book Reactive Design Patterns by Roland Kuhn with contributions from Jamie Allen and Brian Hanafee. The book presents a set of architecture and design patterns that have proven useful in creating reactive systems. The first part (pages 1–63) introduces the concepts and background from the Reactive Manifesto, rounded up with a real-world example and a tour of the tools of the trade. The second part (pages 66–123) presents the theory, the reasoning behind the reactive principles, with links to the literature for further study. The patterns are described in the last part (pages 124–326), each with a one-line summary, an example use-case, and a discussion of its scope and applicability. The appendices contain a diagramming scheme for reactive systems, the discussion of a larger full-scale example, and a verbatim copy of the Reactive Manifesto. Although carefully edited, a few mistakes remain in the final manuscript; if you find one, please check the listing of errata before reporting on the Manning author forum. You are also welcome to contribute to this website, please check out the source. A summary of the architecture and design patterns, both by categories and sorted alphabetically. The video courses from the Coursera course «Principles of Reactive Programming». Following reactive approaches in your applications help simplify the design to a great extent. This book gives you the recipes which any engineer developing reactive applications should follow. From a detailed section about the philosophy behind reactive design to crisp details of patterns to follow in your applications, this book is an essential resource for any engineer designing reactive applications.